Hello. I'm Denise Melo, Centre Director of Mathnasium of Islington Village, your neighbourhood math-only learning centre. We help kids in grades Grades 2-12 understand math by teaching the way that makes sense to them. Mathnasium of Islington Village opened its doors in September of 2018. 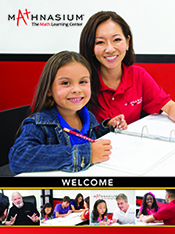 We are passionate about helping your child become excited and confident in math. We offer year-round math programs, including summer programs. We are located in Etobicoke, at the intersection of Burnhamthorpe and Dundas. Come and visit us for a FREE ASSESSMENT and see how we can help your child become CRAZY about math! We're so excited about our sons' math improvements since joining Mathnasium. The boys are more confident and math quizzes are no longer a source of anxiety and frustration for them! Thanks to a great bunch of instructors for making it happen! My son understand his lesson better. And he is getting better in multiplication with the use of calculator. The staff are friendly, helpful and very professional. We are so fortunate we signed up our son, grade 10, for this school and greatful to all teachers and management! We noticed a progress very quick. Our son really enjoys going to classes. Great programm, even better teachers! Program is adjusted to every student and teachers and management realy care about their students sucess. I recommend this school, and this location specifically, to all my friends with kids without any doubts. My daughter really enjoys being part of this "math club" as we like to call it. No complaints after a full month of attending and I've already recommended to friends. Really love the location as it is so convenient for the community. But also love the flexibility in hours. Very different from other programs. Location and times work well; we are new, so will be waiting to see if school marks reflect the benefit of tutoring with your group. Thank you. We are new to Mathnasium however my daughter is enjoying it and we are looking forward to her marks reflecting the solid understanding of the new skills/techniques she has been learning. My son (G10) was pretty weak at math at school. After two first lessons he already felt the difference! Math doesn't scare him anymore. He feels much more confedent and finds it even fun. This means the teachers are great there if they can make grade 10 teenager feel excited about math. i have seen imporvement being with mathnasium. my mark went up 7 percent, and i got 70 percent in one of my tests, this was the highest mark i have gotten this whole year. Totally worth it!! My kids love going to Mathnasium. It’s only been a few short weeks but I can see a real difference already at school. Get 10% Off when you register for 2019 Summer Math Program by May 30!